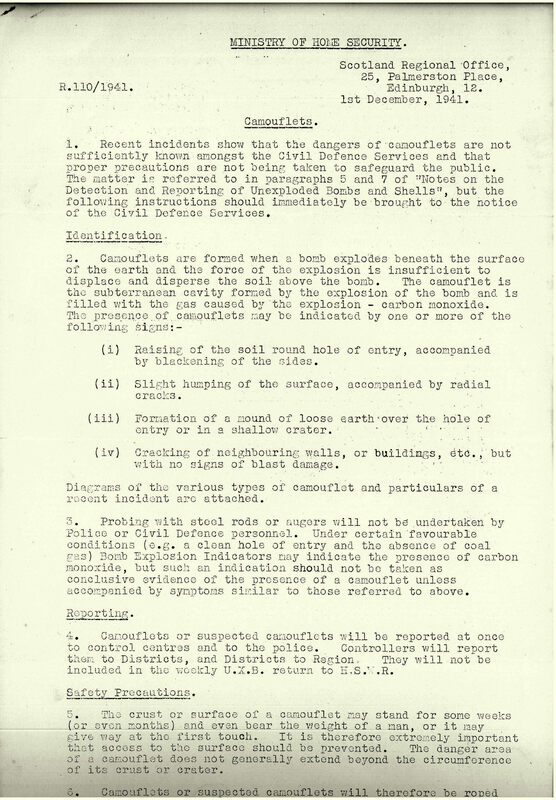 The document of the month for April looks at records from our Perth County Council collection which focus on the air threat posed to communities across the country during World War Two, and the contribution of civilians, both employed and volunteers trying to provide protection from this. The organisational effort made to prepare the public for such eventualities and the measures put in place to try to combat any potential attacks were huge. 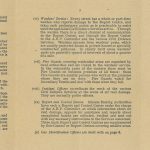 The main civil defence services during the war were Air Raid Precautions (ARP) – set up in 1935 by the Home Office and officially known as the Civil Defence Service from 1941, fire and police services and Women’s Voluntary Services (WVS). ARP Controllers were generally in charge of the Civil Defence Services, and for Perth County Council this was T.B Marshall, the County Clerk. The war permeated everyone’s lives and many people fulfilled war time roles alongside their full-time jobs – it was a real communal effort. One of the primary concerns of an attack from the air was the use of gas by the enemy. 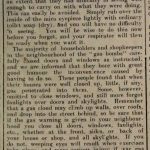 Official pamphlets were circulated explaining the standard drill for services and civilian respirators, and the Stirling Journal article below summarises the results of local gas tests, and the lessons to be learnt in the event of a real incident. 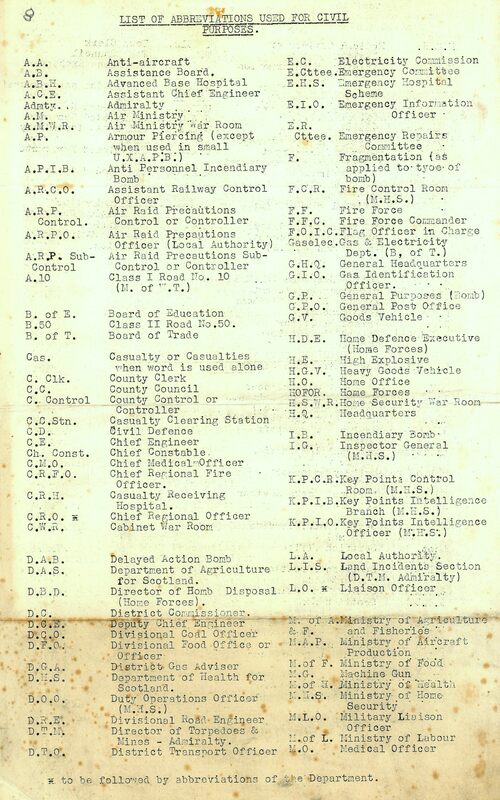 There were lots of new abbreviations to become familiar with too, to ensure the most effective response in an emergency and pamphlets were also produced to make the public aware of all the relevant services in operation and how to contact them when needed. 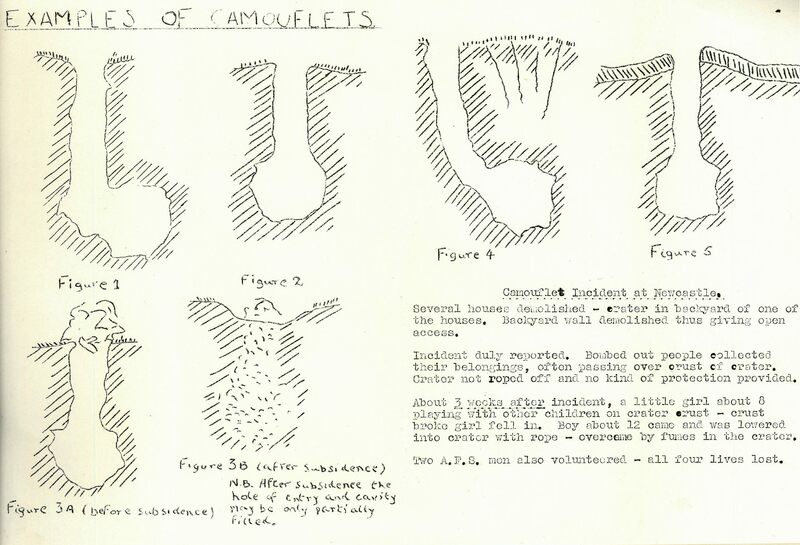 In addition to the obvious risks of falling bombs was the potential for the creation of camouflets. 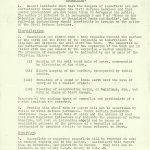 The memorandum here describes these as being “formed when a bomb explodes beneath the surface of the earth and the force of the explosion is insufficient to displace and disperse the soil above the bomb. 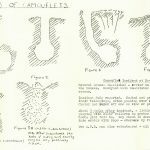 The camouflet is the subterranean cavity formed by the explosion of the bomb and is filled with the gas caused by the explosion – carbon monoxide”. This appears to be a risk which initially, there was not widespread knowledge or understanding of and led to the circulation of this specific document from The Ministry of Home Security with accompanying illustration to highlight the risks. They include a very sad example of an accident in Newcastle which led to the death of four people to highlight the danger. 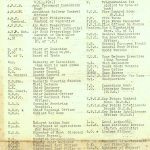 Although the air raids on Clydebank in 1941 are Scotland’s most well-known bombings, there were more than 500 German air raids in Scotland resulting in 2500 deaths and 8000 injuries. Sometimes these were the result of mass bombings, but there were also many instances of lone air attacks and a single plane hitting a target with no military significance, so even in areas which were seemingly safer; the threat was there especially in the earlier years of the war as the article below shows, and these civilian services were essential in helping to keep the country on alert. 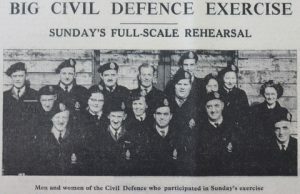 After six long years of war and with victory all but secured, the Civil Defence service was disbanded on 2 May 1945, and a farewell parade in Hyde Park, London, in June 1945 was held with representatives from services across the country in attendance. World events and tensions directly following the end of the war – and the beginning of the “Cold War” era, however, meant little rest from such duties with many being reintroduced in 1949 with the formation of the Civil Defence Corps which operated for another two decades.